"Mr. Robert Goelet entertained [diners] at the Goelet Fishing Club at Beavertail Sunday, the 'Conanicut' making a special trip at midnight to carry the party to Newport"
Through the centuries, Jamestown's approximately 26 miles of rocky coastline have been a lure for fishermen. From the late 19th century until World War II, the southern part of the Beavertail Peninsula was primarily a private playground for outdoorsmen. Many were guests of clubs and camps that were established chiefly for fishing. Often, these organizations came complete with a clubhouse and outbuildings, ensuring guests could fish and be comfortable at the same time. Located several hundred yards from the lighthouse, the Beavertail Fishing Club was one of the most elaborate of the sportsmen associations. Not only did the establishment contain a clubhouse, it boasted a dining room, sleeping accommodations, and a stable. A little less glamorous was Peckham Camp. In the 1910s, Peckham Camp consisted of seven cottages, each rented for $100 for the "season" of four months. An advertisement describes them as: "Bungalows fitted only for camp life. Most all cottages have large pleasant rooms, with broad verandas, hot and cold water, set tubs, open fire places, and are heated by steam or hot air." 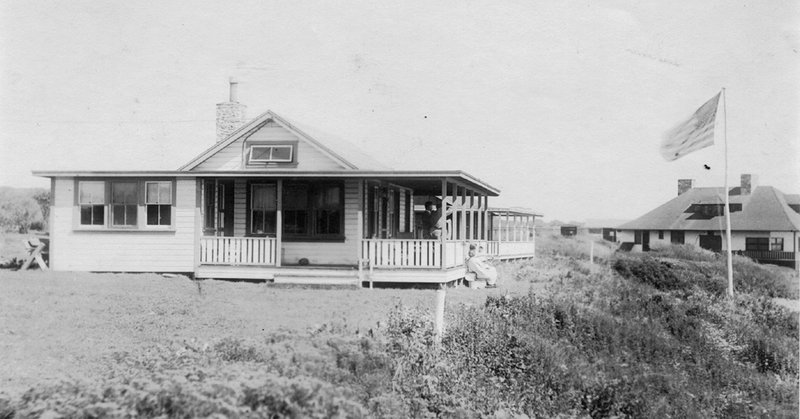 The bungalows at the Peckham Camp continued to be leased each summer until the beginning of World War II. The same families returned year after year, and in some cases, generation after generation. On Dec. 4, 1941, the U.S. Army established Fort Burnside. 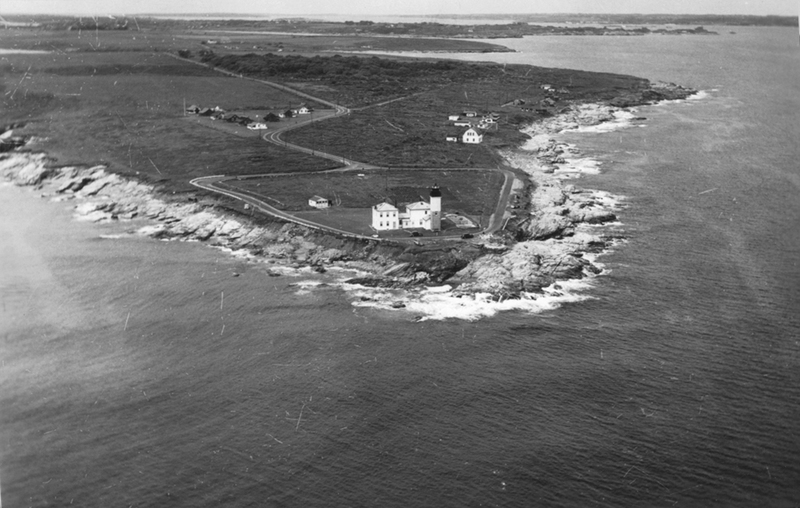 The 185-acre fort occupied the entire Beavertail Peninsula, including Peckham Camp, which the family sold to the government for $15,500 in 1943. Prior to WWII, strategic Harbor Entrance Command Posts (HECPs) were built to protect US coastlines. Fort Burnside was the designated post for Narragansett Bay. Posing as a large seaside cottage, an observation building monitored all the comings and goings of military shipping, all while keeping a watchful eye to the horizon for enemy attacks. Additional structures were built to hold top-secret equipment with advanced radar. In 1945, the military installation was renamed the Naval Radio Station Newport. Over the next two decades, 25 radio antennas were erected, each connected to one or more of 30 transmitters, making Beavertail a Navy communications hub. In 1980, the land was declared surplus and became Beavertail State Park. 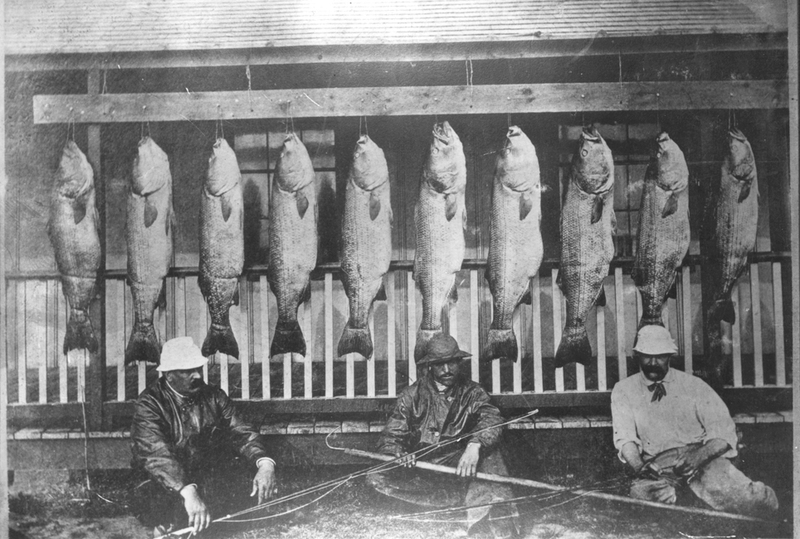 Fishing for Stripers c. 1900: Blackfish appear to be the species of fish most desired by the fishermen of the early 1900s; however, striped bass were also a prized catch and quite abundant, as this picture can confirm. 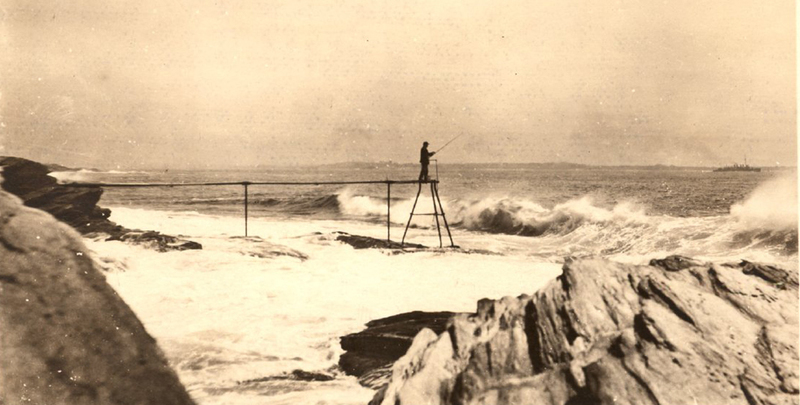 Fishing over the Rocks c. 1900: Many of the striped bass caught in Jamestown in the late 19th Century were taken from one of the fishing stands anchored to the rocks around Beavertail Point. The narrow walkway allowed only one person at a time to reach the end of the stand. Fishing Camps, Beavertail, July 1940: In this aerial view you can see the Peckham Camp in the upper left side; other camps faced Newport on the eastern side. Watson, Carr & Gardner Camp c. 1910: As early as 1900, avid fishermen were complaining that fewer fish were coming into the bay. This picture shows two couples at their leisure in their camp. Grey Ledge, a popular teahouse, is in the background. Harbor Entrance Command Post at Camp Burnside c. 1970: This photo of the HECP shows the only building left after the deactivation of the fort. 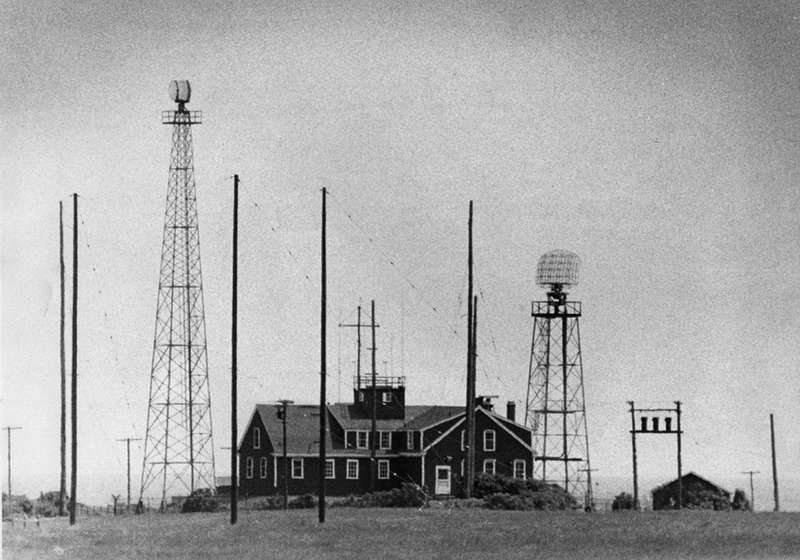 Beavertail became a transmitter site as part of the Naval Radio Station Newport. Many local residents remember the countless radio towers covering the area. Beavertail State Park is open for public recreation. Take a hike along the coast, have a picnic, or simply enjoy the beautiful vistas. More info here. 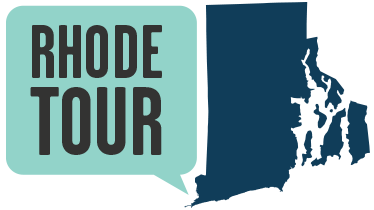 Jamestown Historical Society, “Fishing at Beavertail and Fort Burnside,” Rhode Tour, accessed April 21, 2019, http://rhodetour.org/items/show/289. The Historic Lure of Fishing Conanicut Island, Sue Maden & Tom McCandless, Jamestown Press, August 4, 2005. Fish Stories: Reeling in Bass from Beavertail, Sue Maden & Rosemary Enright, Jamestown Press, September 22, 2016. Fishermen Once Called Beavertail Home, Rosemary Enright & Sue Maden, Jamestown Press, February 2, 2016. Beavertail's Top Secret Spraycliff Observatory During World War II, Varoujan Karentz: http://smallstatebighistory.com/beavertails-top-secret-spraycliff-observatory-world-war-ii.